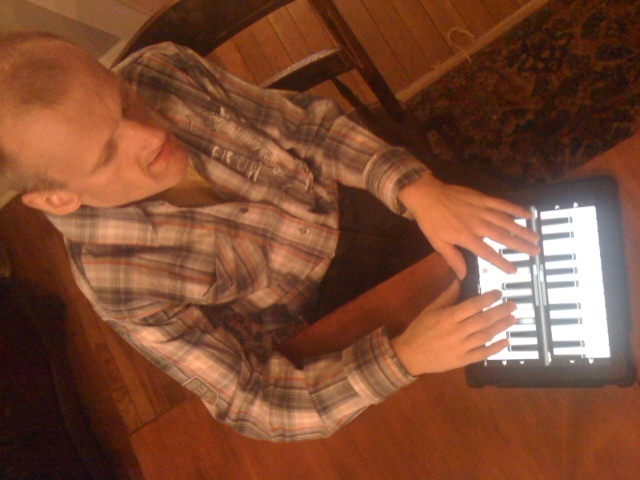 Note: Recently I published a post on using the iPad for augmentive communications. This is an update to that blog entry. Some of you have been wondering about the status of the iPad in communications with my brother David. Thank you for your inquiries. Several behavioral issues may be caused by frustrated attempts at communications?! Ah Ha! Communication isn’t just about words but it is about us expressing ourselves and there are many ways for a person to express themselves…some through art, some through music, as an example?! Ah Ha! We are working through a) technology (which software to load, how to get the downloads and yet how to “secure” the device) and b) staff training on using the tool with an individual so that it is an individualized experience. This meeting was the best Christmas gift ever. It will take a while for the next stage to unfold, so stay tuned. David and I played Virtuoso Piano Duet together. So what? For those of you (parents, siblings, other family members, …) who struggle to meaningfully interact with your loved one, you will immediately understand the so-what. The two of us, with this little piece of equipment between us, sat face to face and as David initiated on his piano, I responded on mine. Yes, there are many ways to express yourself and as a sibling, this was mine… doing something together versus simply sharing a space. Another big day in sib-central. Never give up exploring methods for an individual to express themself and extend themself. Never ever give up. Such a hopeful and loving post! With really good practical insights as well. I was especially taken by the idea of you playing piano in a call-and-response fashion. So cool – and fun, I hope. Rachel, thanks for your comment on my blog! I’ve taken to documenting this year in my own way. Its been a time of exploration through the fellowship and that leads me to be more open in my exploration of other things as well. The iPad has facilitated this nicely. One thing in particular, is that those of us with family members who have more non traditional communications styles and interactions. Well, it is really something to reach a level of “engagement” with our family member. A moment like this is, as they say, priceless. I enjoy following your blog very much. We’ve run down the iPod path with our son for the same reasons you’re using an iPad (but my son will toss it, so the iPod is better). Andy doens’t like the yes/no app. He prefers to think of things as a bunch of choices. He will tell me Yes with a verbalization or by going ot the place and “no” by ignoring me to death. For all the communication methods (including signs and pecs) we’ve used, yes/no is not something he is interested in working to tell me that way. FWIW regarding your brother. Joan, thanks so much for your comment on my blog and also for your recommendations. Its a difficult thing, as you said, the challenge is not in the price but in the evaluation. Oh, and getting other people to use it with my brother! Good news is that his provider is keen. Now we have the hard work of the process to figure out how to get all the bits and pieces of the process to work. Thanks, too, for the link to your blog! Happy New Year! Thanks for reaching out, Kate. have you been able to do enough with him ot understand what is important to him about communication? I think the affordability of the iPad/iPod tools is a double edged sword. On one hand, it gives us the power to act without cumbersome evaluations and insurance hoops. On the other hand, if we don’t choose in a very mindful and strategic manner, we’ll have many false starts before the person we support will buy in. It’s the buy in you’re after. years ago I spent some time with Pat Mirenda, who was an early guru in AAC. Her message is that communication is power – find what it is that really floats the person’s boat and make the first communication activities around that. So, for example, Andy needed to learn that what the device said for him meant something to others. With his first device at home, we acted on the message EVERY time, even if we knew it wasn’t what he meant. In that way, he learned to be more accurate. At School, we set him up with a two big mac buttons and a microphone, and had him commanding a Simon Says game. It was great. The look on his face when the green button made the whole room “go” and the red button made them “stop” was priceless. And now he knows red stop and green is go. Regardless, look at it through the eyes of yoru brother. Think about what it is he most wants to connect with. If he’s at a stage of making simple choices, choose some of hte programs that are more simple in design – we’re using “My Talk” and others that might work are iChoose. You will have to program them for the voice and for age-appropriate choices and pictures, but you may find it means more. For hte iPod, Andy’s taking his first interest by first using the photos, and now watching endless videos of himself that I make. It’s a step!